/ Modified apr 24, 2015 11:37 a.m.
April 24th marks the 25th anniversary of the launch of the Hubble Space Telescope. University of Arizona scientists have used the images from Hubble to make some unexpected discoveries about the universe. UA Astronomy Professor Roger Thompson recalls the high hopes scientists held for Hubble when it was sent into orbit aboard the Space Shuttle Discovery in 1990. He said after a team of astronauts repaired Hubble’s optics, the telescope’s images inspired a generation of space researchers. “The results have far exceeded what we expected at the beginning," Thompson said. "We had a phrase at the beginning of Hubble, ‘Expect the unexpected’ and that’s what we got." 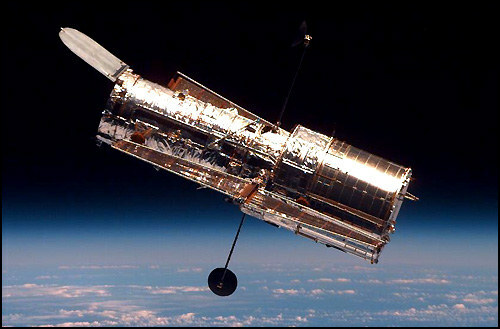 Thompson said one of Hubble’s biggest discoveries was that the universe is rapidly expanding, not slowing down. That finding led to a Nobel Prize in Physics for U of A researcher Brian Schmidt. The bus-sized telescope is expected to remain in orbit for the next 25 years.